Persian Tar Strings | How to string a Persian Tar? How to string a Persian Tar? Before we begin to string a Persian tar we should first know the followings. Persian Tar has totally 6 strings for 3 different tone timbres. Every 2 strings make a couple and they belong always together. The strings 1 and 2 are from steel. The known diameter is 0.20 mm but it can be 0.01 mm more or less in other words 0.19 or 0.21 mm. The strings number 3 and 4 are either from phosphor bronze or from brass. They have a minimum tensile strength of 900 N/mm². 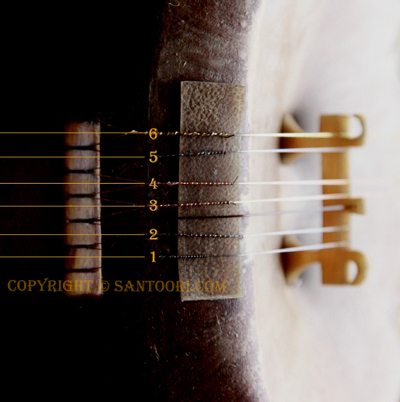 The diameter of third and forth strings of Persian tar is normally 0.02 mm thicker than steel strings. Therefore when we use the 0.20 mm for steel then the thickness of bronze strings are 0.22 mm. The string no. 5 is the same as strings no 1 & 2. They are the same strings, all from steel and have the same diameter. The string no. 6 is the thickest string of the Persian tar, is like the strings no. 3 & 4 either from phosphor bronze or from brass with the diameter of 0.37 mm. This string can have less diameters like 0.35 or 0.36 mm, which is more or less typical for Persian setar. Looping the strings: for looping the strings you may need to practice very much. We would like to show you this as soon as possible in a video clip.